When you pack with Jennifer Jansch's 3 lightweight cubes, all your trip time is fun & none is organizing. As soon as you reach your destination, there's a sparkling beach, a quiet forest hike, or bucket list museum beckoning you. Any time spent sorting out unpacked luggage is too much. 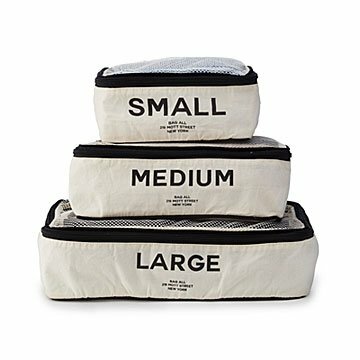 Designer Jennifer Jansch's trio—one small, one medium, one large—keeps your clothes, gadgets, toiletries, and toys organized, so they can go straight from your bag to the hotel dresser. They're lightweight, with mesh tops for visibility and breathability. A bold black and natural cotton design snappily identifies each cube. So grab your swimsuit, hiking shorts, or museum guide from its cube, and get right to it. A super useful gift for frequent travelers and college students. Made in China. Swedish stylist Jennifer Jansch loves giving gifts. Wrapping them in paper that ends up in the trash, not so much. So in 2013, she created a collection of good-looking cotton gift bags that recipients could keep using. Friends soon started telling her they liked using her bags to pack hairdryers and shoes, so she created a line of bags for organizing. She now has boutiques from New York to Australia, and more than 200 designs, including wine and tote bags. Jennifer lives in New York City with her husband, three daughters, and a cat named Ping. We travel frequently and prefer to pack lightly. Organization is the key to our success. The travel cubes are perfect for our needs.